This movie is a spaghetti western, horror, romance, fairy tale, neo-noir, Iranian vampire movie filmed in California!?!?! 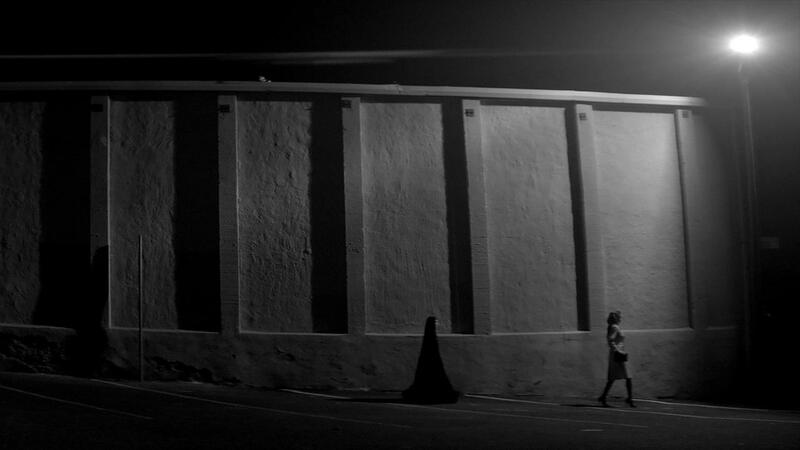 This film is a stew of classic film ingredients by first time director and writer Ana Lily Amirpour. I really look forward to seeing more from her, what a great eye in filming and what an original intriguing story. I seen this just based on the buzz and did not know much about this going in. I really thought it was just a well done horror movie worth seeing. Then I put the Blu-Ray in and was totally surprised. I did not plan to review this for this site, until I watched it and seen more than a few simple nods to the classic film noir era. This film has a timeless feel to it, there is a 1950’s Thunderbird, classic oil wells and factories, and timeless clothing that could fit into almost any time frame. We do have fake posters of 1980’s pop stars on the wall and our soundtrack has music from the 2000’s. If you didn’t know better you could think this was filmed in the 1950’s as easily as filmed in the 2010’s. Sheila Vand plays The Girl and Arash Marandi gives us his best James Dean playing Arash for our two leads. We don’t have to many characters confusing the plot here. Marshall Manesh plays Arash’s junkie father, Mozhan Marnò plays the local prostitute, Dominic Rains as a drug dealer, and Rome Shadanloo as the little rich girl. This movie has a lot of symbolism and references to other films, this may be all subjective and you will find things I may not and you may not agree with what I felt I seen. That is what makes this such a great film. Our story starts with Arash getting in to his car and drives home. We see his Dad shooting up with drugs. Our drug dealer enters the house and wants paid. He takes Arash’s car for the debt. Our drug dealer soon picks up our prostitute in his new ride and later picks up The Girl. He takes her back to his house and soon The Girl reveals she is a vampire and kills the drug dealer. On her way out of the house she pass Arash, going in to try to get his car back. Arash finds the body and takes the drug suppl and gets his keys to his car back. Our romance starts as well as we go deeper into our story from here. So this film is for anybody who wants to see something new and fresh and original no matter what kind of movies you like. This basically covers every genre out there and has something for everybody. Go enjoy this film as soon as you can! I’m afraid I was astounded by how little I liked this movie. There were a whole lot of things to like, as you’ve indicated, but overall I felt the movie was just . . . empty, and for me I’m being charitable there. I gave it a 7 out of 10, and I liked it more for it’s originality and style then anything. If this was shot in color, English, and had an average soundtrack, I probably would not like it either. The atmosphere and artistic styling sold me. The atmosphere and artistic styling sold me. Same here . . . to the extent that the movie did. In fact, a week or ten days after watching it, really only the atmosphere and style of the movie remain with me. Hey Bryan, I’m still trying to decide whether I like it or not! I agree its beautifully shot and the symbolism is effective. I think it could do with being speeder up a little. Some of the scenes outstay their welcome. It was all wort it though for the beautiful scene between the two leads in her room.